Alter The Press! : Niall Horan Announces New Single "Slow Hands"
Niall Horan Announces New Single "Slow Hands"
Niall Horan posted a tweet on Monday (May 1) announcing that his new song, “Slow Hands,” will be released May 4. 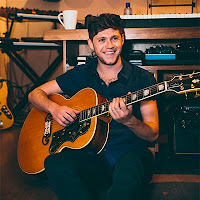 The accompanying cover photo for the single depicts a solemn Horan with a blurred earth-toned background.